In business, particularly sales, time is money. The more time that one has to sell, the more potential there is to make more money. With that in mind, there are certain situations where you have to be much disciplined in terms of the amount of time you spend with a customer. You want to get the sale, but you also don’t want to spend tons of time on one customer when you could have easily obtained two more sales in that time frame. I have been guilty of doing this, and I know many salespeople who have been guilty of the same problem. Let’s say you’re selling phone service for AT&T business-to-business. You should already know how long an average sale takes in order for the customer to be satisfied, and for you to get the information you need to close the deal. Let’s say it takes you 30 minutes to get into the door, make the sale and close the deal. That should be your time gauge that you’re working for. 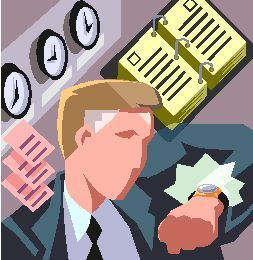 When the 30-minute mark hits and you’re still with the customer after the sale has been made, there is no problem with saying, “I would love to talk later, but I’m sorry, I have a few more appointments to go to before the day is over.” Don’t be afraid to say that because the customer will respect that you have other potential clients. Additionally, you should also have an idea if a sale is not meant to be. In other words, you should know within the first 30 to 60 seconds if the sale is even going to take place, or a good lead will come out of it. Once you realize that the sale will not occur or that it won’t be a solid lead, you have to walk away. You have to also realize that for every person that isn’t interested in buying your service, you’re only getting closer to the client that will buy what you’re selling. All you have to say to the person who appears uninterested is, “Here’s my card, and if you’re interested feel free to contact me.” You’re not being to pushy; you’re just leaving them with something instead of looking as if you’re trying to sell them. If they’re nasty, you can simply say, “I’m sorry to bother you and I will make sure that it doesn’t happen again.” I’ve been in these situations. Sometimes, when you’re extremely nice, the person completely changes their mind, and suddenly gains interest. Just don’t forget, you’re against time, and you don’t want to waste it talking to someone when it’s not going to help you make a sale. You should also avoid talk on the phone on a personal level during your hours of operation. As I said before, time is money in sales, and talking sports with your buddy is time not well spent. Make sure you block out certain times when you’re out in the field to turn your phone on silent or vibrate. That should be your “money time.” Say, for example, you don’t pick up your phone from 11-1 p.m., but call everyone back during your lunch break, which is 1-2 p.m. That’s perfectly fine. After you answer phone calls and eat lunch, your phone should be off line from 3-6 PM. If you start doing that, you will see that your time is being spent intelligently, as you’re maximizing your opportunity to earn a few sales. The last thing you want in sales is for something to break your flow. You will always be tested, especially once you are becoming more and more successful. All you have to do is stick to your guns and stay disciplined in doing so.